In this nice VIS image, taken by the NASA - Mars Odyssey Orbiter on December, 19th, 2014, and during its 57.733rd orbit around the Red Planet, we can see (in the lower portion of the frame) a large and unusually-looking - and light-colored - Surface Feature located on the Floor of Galle Crater. What is it? Most likely we are looking at large Rocky Layered Deposits which, in eons, have been eroded (mostly) by Aeolian Activities. 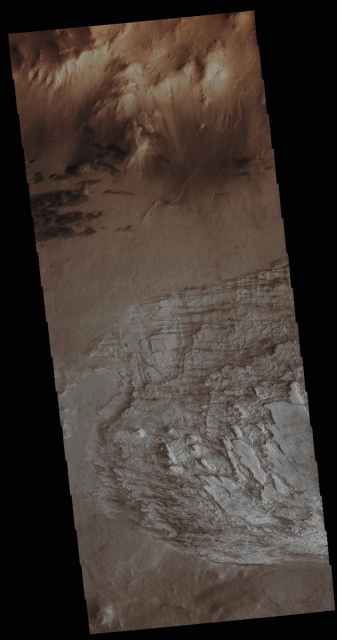 On the other hand, near the Northern Rim of Galle Crater there are small (and possibly Migrating - look at their shape and visual configuration) Sand Dunes; furthermore, we can even see (but, actually, not really well) that there are, once again on the upper side of the picture, a few Windstreak Features, which confirm that the Dominant Winds blowing inside Galle Crater played (and still play) an important role in the Erosive Processes that occurred over there in a remote past and that, in our opinion, as IPF, are - in a very powerful way - still going on. Just out of curiosity, Galle Crater (---> a large Impact Crater located on the Eastern Rim of the huge Impact Basin known as Argyre Planitia and so named after the German Astronomer Johann Gottfried Galle - born on June, 9, 1812 in Radis and died on July, 10, 1910, in Potsdam), is also - and perhaps MUCH better - known as the "Happy Face Crater", because the illusion of a so-called "smiley" is created by a Curved Mountain Range located in the Southern Part of the Crater itself and by two "eyes-looking" smaller Mountain Clusters which are found to the North. However, this peculiar formation was first photographed by the NASA - Viking Orbiter 1. This image (which is an Original Mars Odyssey Orbiter b/w and Map-Projected frame published on the NASA - Planetary Photojournal with the ID n. PIA 19191) has been additionally processed, magnified to aid the visibility of the details, contrast enhanced and sharpened, Gamma corrected and then colorized in Absolute Natural Colors (such as the colors that a normal human eye would actually perceive if someone were onboard the NASA - Mars Odyssey Orbiter and then looked down, towards the Surface of Mars), by using an original technique created - and, in time, dramatically improved - by the Lunar Explorer Italia Team.